We specialize in full color fleet graphics and vehicle wraps from design to installation. Our Xtreme Graphic Collections™ and total identity services will enhance your image. We are the home of Xtreme Graphic Collections™ software libraries which are being sold internationally by distributors with over 100 locations worldwide. Want to try Xtreme Graphic Collections™ before buying? Sign up to download free Air Brush Madness, Xtreme Graphics and Wrap Master seamless tile samples. Get the hottest deals that will save you time and money! Make life easier for the design department and shop our latest promotions and limited time offers today. I just wanted to pass along how happy we are with are new full vehicle truck wrap that was performed by your company. It’s very high quality and is so noticeable from a ways away. The team that installed it was so courteous and very professional to work with as well. We couldn’t be more pleased and will be getting the rest of our fleet done soon by your company. Thanks! "Darcy - It was a pleasure doing business with you and your staff, I was very impressed with the professionalism and graphics you and your team provided us with. We look forward to doing more business with you in the future." "Very impressed with how efficient and professional Darcy and team were to deal with at Taylor Digital. The work was done quick and looks fantastic. Excellent Service"
We have used Taylor Digital Imaging products for years, from the graphics to the wrap master collection. It has helped to design and take products to a new level that has set us apart from the competition. Anyone serious about design these are must have. Launching our new station was a large undertaking and having visibility in the market was key. Darcy and his team provided superior work with a professional approach and state of the art technology. With so many details to look after at this time, it was great to have one less thing to worry about. I knew everything was looked after when it came signage, vehicle wraps and promotional gear. From design to install, Darcy and his team created an experience that could not be beat and a final product that we are very proud of. We came into town not knowing the area. Asking around, several people recommended Taylor Digital and we were not disappointed. We found an enthusiastic team that were excited about our business and our success. We push a large volume at Taylor and were very satisfied at both the quality and the price. Air Show Atlantic was successful due to many factors, Taylor Digital was one of them. "We at the Beaverbrook House are very impressed with the beautiful sign and it was installed quickly and efficiently. Great work!" Taylor Digital packages are the most impressive that I have seen, and the only ones I have actually purchased personally. I have the 1-8 set and the Extreme Wrap Master 1 and 2. I just wanted to let you know how happy we are with our new service truck. The graphics are beyond what we expected. Everyone that has seen the truck thinks it looks awesome. Great job as usual. I have had a lot of success with the DVD collections ,especially the Air brush madness series and the Print and Cut Auto graphics, my clients are blown away at the detail and quality of all the designs .I highly recommend Taylor Digital Imaging products. You have great products and prices! Xtreme Graphic collections have been a great product for ND Graphics, and our customers. Not many have the digital expertise that the graphics artists at Taylor Digital do. Many of our customers find that the cost of a DVD package is covered with the first job they do with the artwork. Xtreme Graphics DVDs are a must for any shop with a digital printer. My name is Jessie McKenna, in my real estate business marketing is very important. I have had my car wrapped for a number of years and decided to rewrap my vehicle. I was approached by Darcy Taylor to see if I was interested in a new wrap. His professionalism and fairness was amazing. The wrap exceeded my expectations and I was so happy that he included me in all aspects of the wrap, so that I woud be totally satisfied in the end result. If you see me driving around town, the product speaks for itself 'AWESOME'! I would highly recommend these graphics packages to anyone! All the files are easily workable and the cut files are perfect. No problems at all with these and we’ve had them for years!!!! Well worth the investment! At Immortal Graphix we are very picky when it comes to adding new artwork to our library. We met these guys at a trade show and decided to purchase the print and cut volumes 1-8. We are always looking for good artwork, but it is not just artwork. It needs to print good and we like to see easy usability. The print output of these graphics are great! The cut lines are just as good. All you have to do is upload and go. Once we added the designs to our website, we saw instant results within the first few days. Rarely does this happen so fast when we add new products. We highly recommend purchasing these products. If you have any hesitation, put that aside, as we did and it payed off for us over and over again. I recently purchased your Air Brush Madness graphics collections and found them to be 'as advertised'. The art is phenomenal quality and the DVD/Catalog packaging is impressive as well. I would have easily paid a freelance artist $300.00 for ONE design of that quality. This package provides excellent value for a shop like ours. I look forward to seeing your future collections. Working in a sign shop for the past 10 years now, designing is a major part of my day and finding the right clip-art and/or inspiration is always challenging. It is a challenge that always needs to be minimized so more time can go into production. I've been using the X-Treme graphic series for the past couple of years now, and without a doubt I have saved myself numerous hours of design time while enhancing but not compromising the end product. A key part in finding that perfect clip-art or image, is being able to sort through pages of categories and details. This is made easy with the very colorful, picture oriented books (provided) demonstrating many examples and/or uses....plenty of inspiration to view. The image quality is very satisfying with much attention going into the small details....I would highly recommend having any of the X-Treme graphic series in your portfolio. www.xtemegraphiccollection.com had exactly what I was looking for. The variety, quality and clarity of the images is just amazing and I shall have endless fun playing with and working them into my designs for future projects for customers. 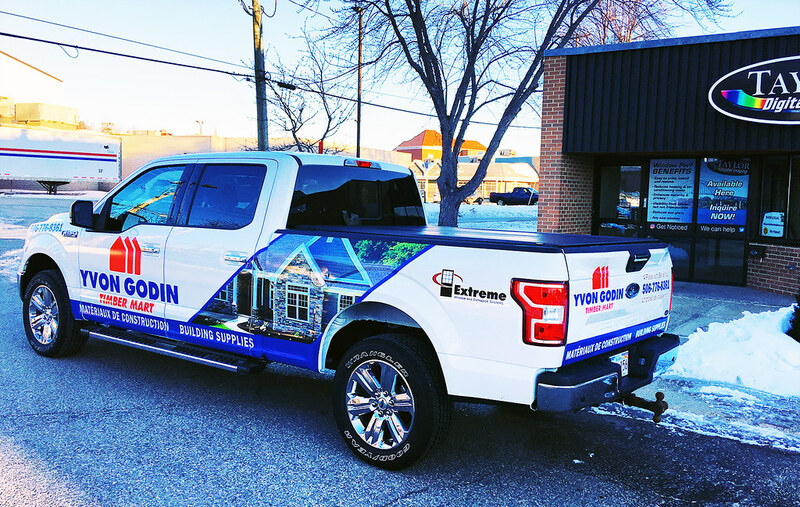 I used Taylor Digital Imaging to wrap my two vehicles and trailer and I have never been so impressed with a company’s layout and graphic images. They do amazing work and stand by their product. I would certainly recommend Taylor Digital Imaging for all your design & graphic work. We recently amalgamated 2 Credit Unions, and were looking for a customer friendly sign company who could meet our needs for revamping our 6 branches. Darcy Taylor and his team not only met that need, but blew everyone else away in the process! We have utilized Taylor Digital’s services for the past 14 years and are very pleased with the quality of work and the professional way Darcy conducts his business. We were looking for signage and advertising support material to really make our new head office stand out. Taylor Digital worked with us through the entire process giving us plenty of options and guidance. It worked, our new building has been a hit and our business has grown 48%. If you’re looking for fast and professional service at a competitive price, Taylor Digital is the place to call. The graphics you installed this summer on 5 of our trailers are really sharp and vibrant. We have received positive feedback on our new trailer graphics. Darcy Taylor and his entire crew have been amazing to work with, just amazing. Impossible deadlines? He helped us meet them. Impossible budget restrictions? He offered creative solutions to get something that would meet our needs and *not* break the bank. And the quality of the work speaks for itself. Taylor Digital has top notch gear and fantastic creative design which makes *us* look great. Wanna look great? Give ‘em a try! Can you Wrap a Motor Home?